ARTBA’s Aug. 29 Engineering Issues Breakfast at MAASTO in Michigan. Nearly 50 people attended ARTBA’s annual Engineering Issues Breakfast at the Mid America Association of State Transportation Officials (MAASTO) meeting in Traverse City, Michigan. 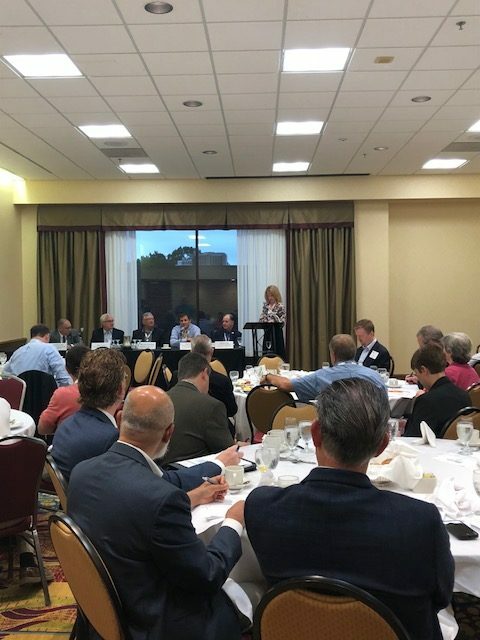 ARTBA’s Planning and Design Division President Susan Martinovich, from Jacobs, moderated the Aug. 29 roundtable discussion with five state transportation department leaders from the region. Topics included new technologies, workforce issues, funding and alternative delivery. The discussion made clear that many of the Midwestern states are advancing or exploring high tech innovations such as autonomous vehicles, platooning, traffic management applications, and more. Many of the agencies also provided detailed handout information on their state transportation programs. To receive a copy, or for more details on upcoming ARTBA events at the AASHTO regional meetings, please contact me.